You may have noticed that iPad can be charged not only with the included iPad charger, but also by using an iPhone charger, or by connecting an iPad to a computer via USB cable to charge. While all of these methods will charge an iPad battery, though some slower than others, sometimes you may encounter an error message with certain charging methods, where the iPad says it is “Not Charging”. The “Not charging” message usually shows up when iPad is plugged into a computer via USB, but sometimes it will show up when plugged into an iPhone charger as well. While there are many reasons an iPad may report it is “Not Charging”, a particularly common reason relates to the power source, and thus here offers a simple solution. But there are a few other possible issues that can cause an iPad not to charge as well, so lets cover the most common reasons an iPad will show “not charging” message in the top bar of the device, and what you can do to fix it. Before going any further and tweaking with power cables and iPad chargers, check the iPad charging port for any potential gunk, dust, lint, debris, or another obstruction. Use a wooden or plastic toothpick and clean out the port on the bottom of iPad to make sure there’s nothing stuck in there. This probably sounds silly, but it’s more common than you might think to find some kind of stuff jammed into the lighting port on the bottom of iPad, particularly if the iPad gets placed into bags often, or gets used frequently by kids. Mystery lint, play dough, food particles, a grain of rice, dirt, rocks, you’d be surprised at the strange things that can end up jammed into the little charging ports which will prevent the thing from charging at all, so be sure you thoroughly check it and make sure it is clear of obstruction. Anything that interferes with a connection can prevent the device from charging, and while crud prevents iPhone from charging far more often than it might on an iPad, it can still happen to the tablets too. * You can always buy a Lighting USB cable from Amazon for a reasonable price here if need be. Important: if the USB cable is frayed, torn, or otherwise damaged, you will want to get a new USB cable and use that one instead. A damaged charging cable will be unreliable at best and should be replaced as soon as possible, you can get a new Lighting to USB cable from Amazon for a reasonable price here. Be sure you get a certified charging cable, since cables that are not certified often won’t work. That alone may resolve the issue, but not always. A solution that almost always resolves the iPad “Not Charging” message if it relates to power insufficient is plugging the iPad directly into a dedicated iPad 12w charger from a wall outlet. 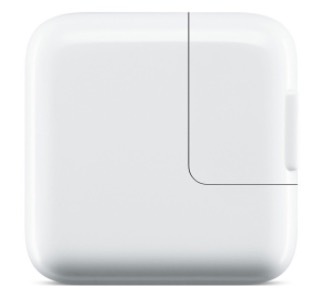 These come with every iPad sold and look like a little square block that plugs into an outlet. Note you want to use the iPad 12w charger, and not a 5w iPhone charger, because while the iPhone charger should technically charge the iPad, it will do so much more slowly simply because the power output is dramatically less (5w vs 12w). You may also experience that if a game or something power hungry is running on iPad while connected to a 5w iPhone charger, the battery may still drain despite being connected, simply because the charger power output is dramatically less than what is intended for iPad. Thus, use the 12w iPad charger, and it should charge just fine. If you somehow lost the iPad 12w charger you can buy a new one on Amazon for a reasonable price here, some of them are third party chargers so pay attention to who you order from on Amazon. If you’re still having problems you can also see some tips on how to fix an iPhone that won’t charge here, most of those suggestions apply to an iPad as well. Those three major tips should solve your iPad charging problems if you see the “Not charging” message in the top bar of the iPad. Give them a go and let us know what works for you in the comments below. I’ve recently had this problem; would get the ‘Not Charging’ message after connecting my iPad to the Lightning plug. While I suspect it’s probably gunk related, a quick clean-out didn’t help. What did, though, was unplugging the USB plug from the 12w brick, connecting the Lightning port, and then reconnecting the USB plug to the brick. Closer inspection of the Lightning port showed wear at the front part of the terminals, so waiting until it was seated before the power was connected allowed it to charge, until I could get a replacement cable. I’ve found that “not charging” often actually means not charging while the screen is turned on. Once the iPad is turned onto standby with the screen off, it often does charge, albeit not necessarily quickly. This can be proven by waking the iPad up after a while, and you’ll see the percentage charged has increased. It will also still say “not charging” because the screen is chewing up all the external power! This phenomena seems to happen when the amperage of the charging source is insufficient to charge the battery AND power the screen. To speed the battery charging up in that situation, turn the iPad off altogether. I had this problem once. I found instructions online that said to shut down the iPad and upon reboot, all at the same time, press the home button, off button and plug in the lightening cable. It’s difficult to do all 3 at the same time, but I’ve had to do this twice over the course of two years and it worked each time. Thanks so much. I had tried everything and nothing worked. I was considering buying a newer iPad. But your suggestion worked!!! Thanks again. Hero stuff right here. Great information. Worked for me as well. Please put me on your mailing list. You’re completely ignoring that Apple did this with a programming “update” in iOS 11.?? maybe 11.2. Our iPads charged from our PCs (two laptops, two home desktops, 20+ work pcs) for the two years that we’ve had them. Immediately after one of these “updates”, our iPads will only charge from a wall charger or car charger. I’m curious as to why all the “tech” help out there continues to ignore this and why they haven’t patched something to allow this to work once again. The iPhone and iPad charges fine with a USB cable as they were designed to do, maybe you need to replace your cable. iOS software updates will not change your hardware cables. If you are having problems, it may be hardware oriented. Interesting. I have not experienced that Jason, with iOS 11.4 I can charge my iPhone / iPad from a USB cable connected to a Mac laptop without issue, but it is much much faster when charging from the iPad wall outlet. It’s unlikely an iOS software update has impacted the charging capacity of the iPad or limited the power output of USB, though if the laptop that is connected is on battery power it may struggle to have sufficient power to charge another power hungry device. I have noticed this misleading message. Without establishing a clear correlation between cable and source, I downloaded a simple battery monitoring app this morning and confirmed that my iPad is charging as I write this, despite the Not Charging announcement. I would recommend doing the same before worrying too much about it. You are simply charging an iPad. You do not need iTunes and you do not need to enter a password to charge an iPad. Just plug the iPad into a power source, it will charge. There is no password requirement, and there is no iTunes requirement. I have a cable that only charges if put in with the charging symbol is facing up. If put in the other way it wont charge or will charge but very slowly. trying flipping the part that fits into the IPad. I had the same problem of having to flip the iPad connector for quite a while, now it doesn’t help. I’ve blown out the iPad power connector and inspected with a magnifying glass, it’s clear. One weird thing is if I open iPad’s Status it says CHARGING but the battery indicator at the top right says NOT CHARGING. If I shut the iPad down it will very slowly charge, like overnight it will reach 60%. 5.13volts, 0.11amp, 0.56watt. I’ve gone through the shutdown and reboot several times without any change. The problem started about a week ago. Still having problem with iPad Pro displaying “not charging,” however, if left plugged in over night it will reach 80% charge. Many times when I select “Device Status” it displays “Not Plugged In.” Even though it is still plugged in. These problems started about a week ago and is VERY annoying. I just ordered the new iPad Pro, but I want this one fixed, because I plan on giving it to my daughter. Before this started I could plug in the charger and it would recharge fairly quickly. I’m still using the same charger, but have swapped cables twice, but that didn’t help. I have thoroughly enjoyed the use of my iPad and would like for it to continue serving my family. Have a Blessed day.